Back-tested results often look good on paper because stellar performance could have come from curve-fitting. If that were the case, then my "Holy Grail" model would not have withstood the test of time. But in the 32 months that have passed since its publication, investors who heeded its advice would have outperformed the market on a risk-adjusted basis. I presented my Holy Grail model in a three-part series entitled Moving Average - Holy Grail or Fairy Tale (Part 1, Part 2, and Part 3) nearly three years ago. Let’s review the rationale behind my methodology, how the Holy Grail works and the out-of-sample results since its publication. Academically cited, empirical evidence has traditionally favored buy-and-hold over active or tactical investment strategies. That evidence shows that no one beats the market in the long run. But this conclusion is only correct if “the long run” means from the 1940s to the 1990s, the period over which most of this research was conducted. The problem is that this conclusion was biased by the highly skewed data. This period encompassed two spectacular bull cycles (1940 to 1966 and 1982 to 1999). A more appropriate conclusion would have been, "buy-and-hold works in bull markets." The “Holy Grail” method captures as much of the bull markets as possible, while avoiding the worst of bear-market cycles. As a result, it outperforms buy-and-hold on a risk-adjusted-return basis in both bull and bear markets. Market timing is generally misconstrued as synonymous with forecasting market turning points. By this definition, I am not a "market timer." I cannot anticipate market turning points in advance. My notion of market timing is similar to atmospheric monitoring. We do not need to forecast the weather in advance, but we must be observant of ever-changing weather patterns and be ready to act accordingly. To detect and track weather changes, meteorologists use temperature gauges, barometers, and computer models. To monitor investment climate, I use market-timing models. As a technical timing model, my Holy Grail model does not offer predictions. It follows price trends. In future articles, I will present other types of timing models that are driven by fundamental, macroeconomic, cyclical, and seasonal factors. These environmental gauges enable one to better assess the investment climate. My Holy Grail model is a six-month exponential moving-average crossover (EMAC) system. I use Professor Robert Shiller’s S&P 500 data series as the signal generator, because it has a long history dating back to 1871 and because it is accessible to the public. My Holy Grail model turns bullish when the Shiller S&P 500 crosses above its six- month EMA and bearish when it crosses below. When the model turns positive, one invests in the S&P 500 total-return index and collects dividends; when it turns negative, one sells the S&P 500 and puts the proceeds in cash. For a detailed description of my model, please refer to the three-part series to which I linked in the introduction. It is not my intention to promote the Holy Grail as a trading tool; past performance cannot be assumed to prevail in the future. The Holy Grail is used as a counterexample, to disprove the claim that buy-and-hold is the only logical investment strategy. Holy Grail proves that one can beat the market by following trends, not by predicting market turning points. After my 2009 articles, I received excellent feedback from many readers. Two of their suggestions are incorporated in this update. The Shiller Index I used previously was based on the monthly average of the daily close of the S&P 500 and, as such, it was not a tradable vehicle. My first refinement was to use the S&P 500 monthly close prices from Ultra Financial dating back to 1942 in performance calculations. Prior to 1942 (when Ultra’s data was not available), performance was calculated with the Shiller Index. The second refinement involved the sales proceeds. Instead of cash, the proceeds after all sell signals were placed in 90-day Treasury bills from 1934 to present and in the 10-year Treasury bonds prior to 1934. The Holy Grail signals over the entire 140-year span are shown graphically in Figure 1. Green segments depict periods when the Shiller Index was above its six-month EMA, while pink signifies periods spent below that average. The blue line in Figure 2 shows the cumulative value of a portfolio following my Holy Grail model, and its value is based on three contributing factors: capital gains from the Holy Grail's buy signals, dividend reinvestment while in the markets, and proceeds from Treasury bills following the model's sell signals. A $1 investment in 1871 would have soared to $1.3 million by February 2012, a compound annual growth rate (CAGR) of 10.6% (this strategy is depicted by the blue curve). By comparison, $1 bought and held with dividend reinvestment (the orange curve) reached only $164,000 over the same period, a CAGR of 8.9%. That is a 162 bps gap in annual rate-of-return over the 140 years. Besides higher returns, the Holy Grail model also offered significantly lower risk (volatility) measured by standard deviation. The annualized standard deviation of the Holy Grail system was 10.5%, a whopping 500 bps less volatile than buying and holding, which yielded a 15.3% standard deviation. The Holy Grail diminished what would have been devastating losses from bear markets and allowed profits to run during bull markets, achieving the two most essential objectives in money management: capital preservation in bad times and capital appreciation in good times. 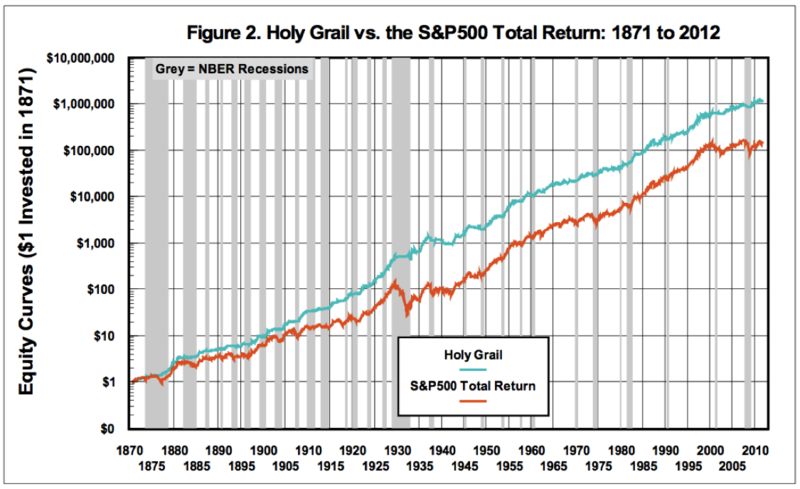 How has Holy Grail fared in the current decade-long secular bear market, and – even more importantly – how has it done in the 32 months since its publication? 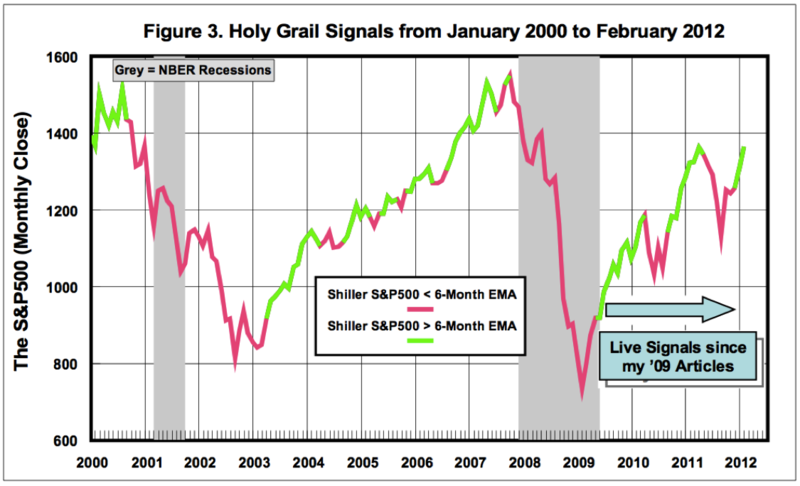 Figure 3 updates the Holy Grail signals from June 2000 to February 2012, with a blue arrow to mark the month when Advisor Perspectives first published the Holy Grail. All signals to the right of the marker represent out-of-sample data, including current results. If the promising historical back-test performance was merely a product of curve fitting, the results of the out-of-sample data should be noticeably worse. There were two mini-bear markets during the 32-month out-of-sample period, one in 2010 and one in 2011. The Holy Grail sidestepped both of them. It did not sell at the peaks, but then a trend-following system is not expected to do that. 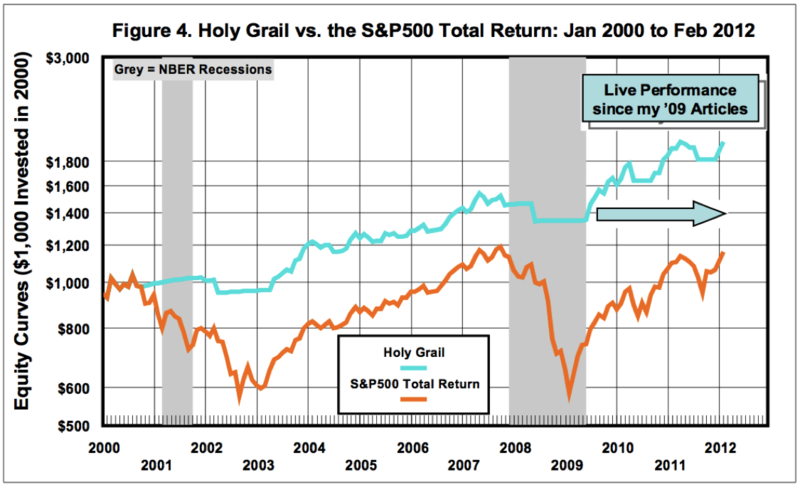 The Holy Grail simply continued to offer downside risk protection and preserve principal through bad times. Figure 3 also demonstrates that the Holy Grail strategy accomplished its second objective, staying in the game in good times. Buy signals did not coincide with market bottoms, but once the rallies were confirmed buy signals followed. The latest buy signal came in December 2011, just before the January/February surge intensified. Figure 4 compares the cumulative results of the Holy Grail over this period to those of the S&P 500 total-return index with dividend reinvestment. Each of the two strategies was assumed to begin with $1,000 in January 2000. Again, the blue arrow depicts the out-of- sample period. 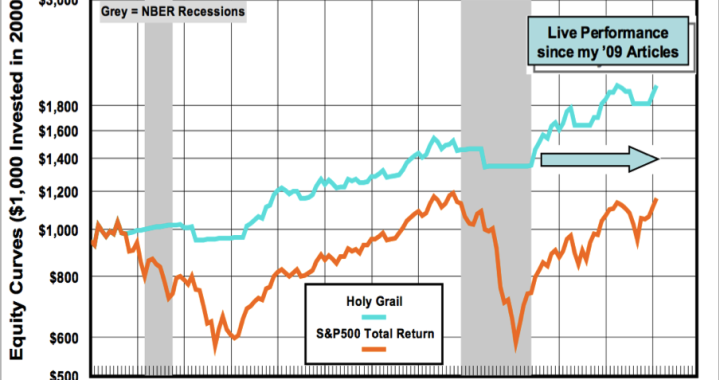 Holy Grail not only avoided both the dot-com crash and the sub-prime meltdown, it also softened the blows of the 2010 and the 2011 market corrections. Since June 2009, the CAGRs for the Holy Grail and buy-and-hold were 15.3% and 18.4%, respectively. 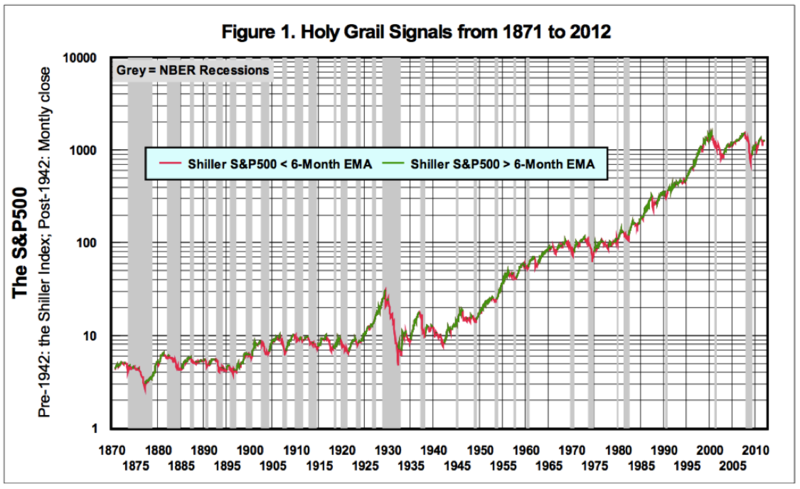 The Holy Grail offered a much lower annualized standard deviation of 11.3% than the S&P 500’s 15.8%. Thirty-two months of live performance demonstrates that this simple trend-following system continued to add value. Simplicity: Moving-average crossover is the simplest system one can employ. In systems engineering design, the number of potential failure modes linked directly to the complexity of the system. In modern physics, simplicity and elegance are accepted as important contributors to proofs of concepts. Time and again, complex models may show great promise, but it is the simplest, most elegant systems that ultimately prove to have lasting relevance. Commonsense rationale: Following market trends appeals to one’s common sense. All reliable models anchor on sound logic. Simplicity without rationale is naive. The Super Bowl Barometer may be simple and even look good statistically, but there is no logic behind it. Good models do not require the support of advanced theories or intricate algorithms, but they must have a cause-and-effect rationale. Rule-based clarity: The buy/sell rules of Holy Grail are black-and-white. Being simple and logical would not be enough. The rationale must yield clear, actionable rules. If we cannot write buy/sell rules that a computer could compile, we do not have a rule-based model. Objective, quantitative models have no room for interpretation or ambiguity. The signals are either positive or negative, without qualifiers, provisos, or exceptions. Sufficient sample size: The Holy Grail was tested over 140 years – a more-than- adequate sample size. Contrast this sample with that supporting the claim that "no one beats the market in a long run." If researchers extended their database beyond the study period of 1940 to 1999, they would have come to my conclusion: "buy-and-hold has only worked in bull markets." Adequate data: Similarly, because the study period on which my evidence rests includes multiple bull and bear cycles, it represents an appropriate pool of underlying data on which to base conclusions. An example of inappropriate data would be the all-too-common practice of applying economic theory to the Great Recession using data from the post-WWII recoveries. The Great Recession was a balance-sheet recession that paralleled only the Great Depression. All other post- WWII recessions were business-cycle recessions. They were two different beasts. Having simple, rule-based models that rely on common sense with ample and appropriate supporting data is only half the battle. The real challenge lies in execution. President Reagan's approach to the Soviet Union was "trust, but verify." If we anchor our trust on simple, logical and objective timing models, we can boldly pull the execution trigger. Timing models are tools. Discipline in executing them makes money. Ned Davis, in his book Being Right or Making Money, confessed that his biggest flaw as a money manager was that he tended to let his personal ego affect his market view. What was his remedy? He entrusted his market view to mathematical timing models. The strict discipline they offered allowed him to take an objective approach, while avoiding the fool’s errand of trying to “beat” the market on guesswork alone. With the right tools, Davis was able to see past the conventional academic wisdom that buy-and-hold is the only option. Are you?